The beverage engineers at Boston-based startup Bevi are hard at work building a drink dispenser that can call up the finest details of your workplace drink order. How much lime flavoring is enough? How effervescent should the carbonation be? What mix of vitamins should be added? “We see that people are getting more and more specific about what they want for themselves,” says Sean Grundy, co-founder and CEO of Bevi, a six-year-old Boston startup that makes a beverage kiosk that dispenses flavored drinks. The company says today it has landed a $35.5 million Series C funding round led by Bessemer Ventures. The sum pushes the company’s total venture capital haul to more than $63 million. Kent Bennett of Bessemer—who’s worked with food startups Blue Apron, MealPal, and Toast—-is joining Bevi’s board as part of the financing, the company says. Earlier Bevi investors Horizons Ventures and Trinity Ventures both joined in the new round. 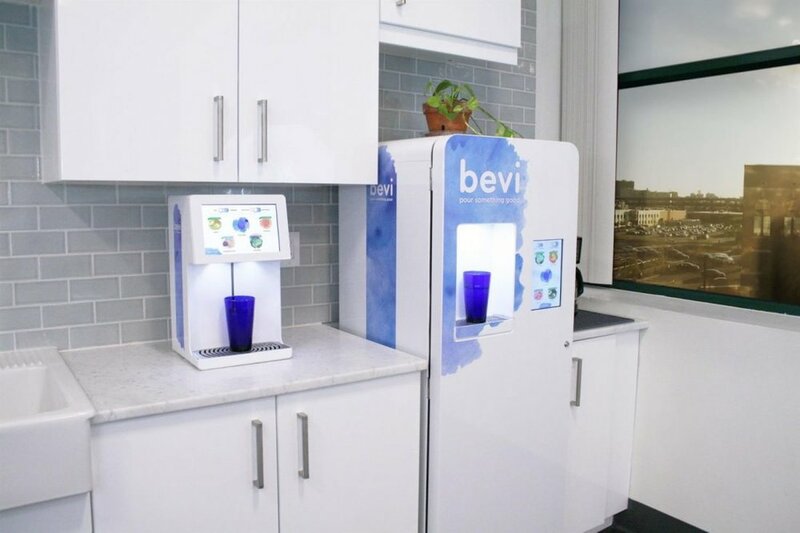 Bevi was founded in 2013, and by 2017, its Internet-connected beverage kiosks had been deployed in the offices of approximately 370 companies, including Apple, AT&T, Fidelity, GE, and Netflix. Grundy says the company’s sales grew “well over 100 percent” this past year. Its machines have a touchscreen that lets thirsty users select still or sparkling water, and add any variety of flavors. People’s taste preferences for drinks are all over the map, Grundy says, making it harder to nail down the stock for a drink machine that will satisfy the masses. He says Bevi customer surveys show scant agreement about how drinks should be made, such as how much raspberry flavoring is enough or what is the “correct” bubble strength for a carbonated drink. Bevi is working to provide users the ability to dial in the details and let the beverage machines recall those preferences when people return for a refill. Exactly how the machines will identify return customers is still in the works, with phone apps, badges, and radio-frequency-tagged bottles all being explored, Grundy says. In fact, the proprietary bottle was an early focus for Bevi when it aimed to control each step in the drink dispensing process. “In the future, we would definitely be interested in bringing that back,” Grundy said. Worried that big tech is taking over your afternoon strawberry fizz? Grundy says the identification system will stay an opt-in system and users will still be able to use Bevi to get a drink without it saving their preferences. PepsiCo’s recent $3.2 billion acquisition of SodaStream, the Israeli company that makes a kitchen drink carbonation machine, is an encouraging signpost for Bevi’s quest to customize drinks in the workplace. Bevi’s push for personalization comes as the company is also hiring to boost its brand and put its products in more offices. Bevi currently has about 90 employees (with about 40 openings scheduled to be filled in 2019), and the company is in about 30 states and a few cities in Canada. Over the last year, Bevi has been stocking its executive ranks. The company hired Bob Doucette, who ran global operations and logistics at Amazon Robotics, to be its chief operating officer. It hired Boston Dynamics engineering veteran Thomas Allen to head up hardware. And it brought on LogMeIn sales director Todd Johnston to head Bevi’s sales. “We’ve been recruiting executives from the best of the best of Boston technology companies in order to become one of the best ourselves,” Grundy says, adding that the company is currently hiring a marketing VP. Bevi’s previous funding round in mid 2017 clocked in at $16.5 million and prompted predictions that the company could seek expansion while also starting to make a profit. Now in 2019, Grundy says the goal—which even then he admitted was “easier said than done”—went unrealized. But he hasn’t given up on it. But back to profitability: Grundy says it wouldn’t surprise him if Bevi is still seeing red ink in two years and chasing a profit after it raises its next funding round. Grundy says the some of the personalization updates they are planning for the machines can be added through software updates to the Bevi units, others need physical upgrades from a service technician. He also says hot drinks are on the company’s future product roadmap.